If you have a tailgate party, a block party, or just a family get together coming up, you’re going to want to save this recipe. 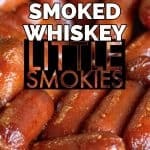 Smoked Whiskey Little Smokies are easy and fun to make, and your friends will love them! These little weiners don’t get enough credit. 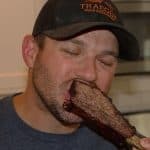 They’re cheap, and after 90 minutes in your smoker, you’re going to have a new found love for them. 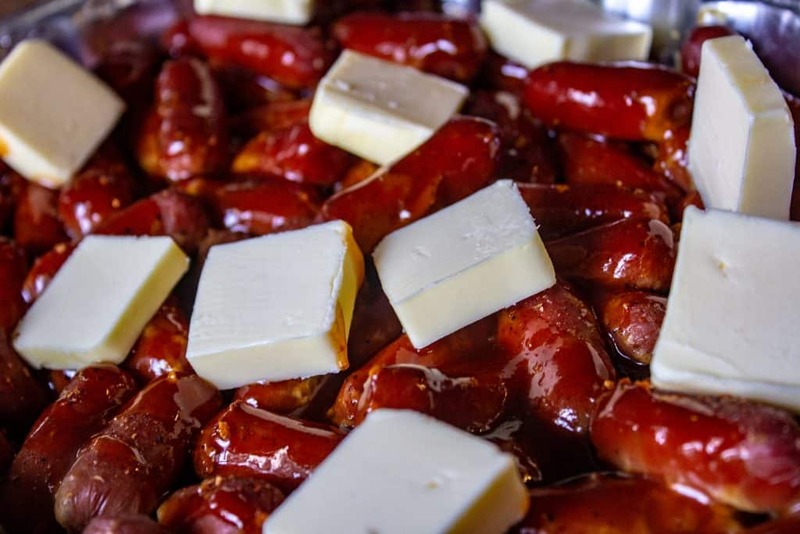 To make smoked whiskey little smokies you’ll need four packages of little smokies, some whiskey, brown sugar, barbecue sauce, dijon mustard, bbq rub, and butter. 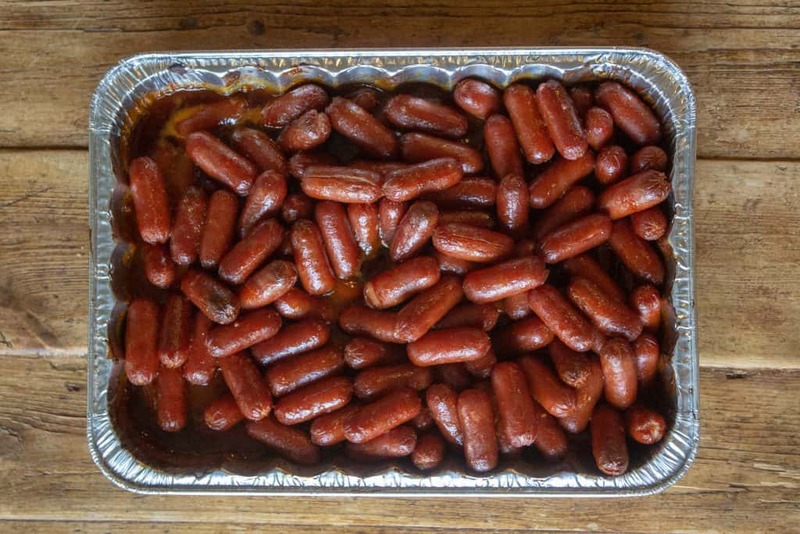 Open the four packages of little smokies and put them in a medium-sized disposable tin. 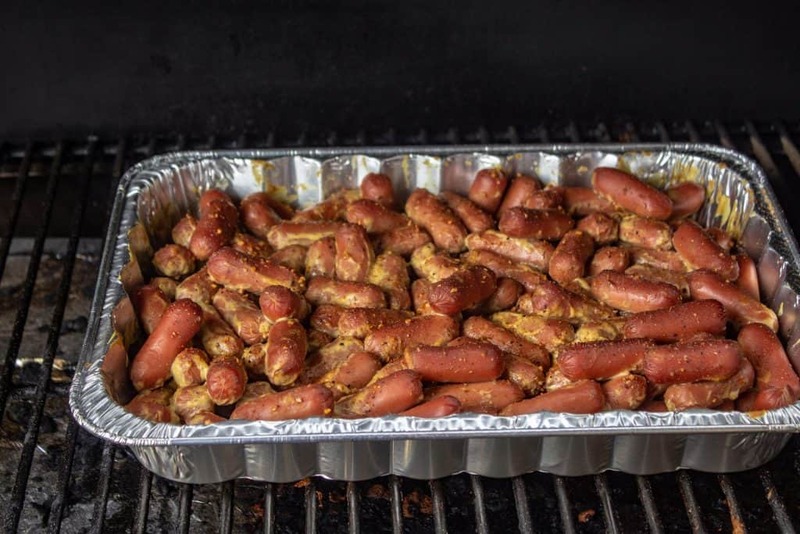 Add a half cup of dijon mustard to the little smokies and toss to get them all coated. Follow the dijon with a liberal dusting of your favorite bbq rub. Get your smoker up to 225 degrees, and put the little smokies in. After 30 minutes remove the little smokies from the smoker and get the temp up to 425 degrees. In a medium-sized bowl combine one cup of barbecue sauce, a 1/2 cup of whiskey, and 1 cup of brown sugar. Whisk until smooth, and then pour over your little smokies. Cube up one stick of butter, and add to the pan. Throw the little smokies back in the smoker. Toss them every twenty minutes. After an hour on high, they will be done, and most of the little smokies will start to get some caramelized sugar on them. This is what we want! The whiskey will cook out in the high heat, but the flavor remains. 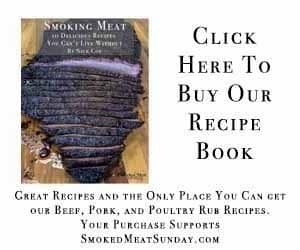 This recipe is similar to my burnt ends recipe. It’s easy to make, and perfect for your next tailgate party or family get together. 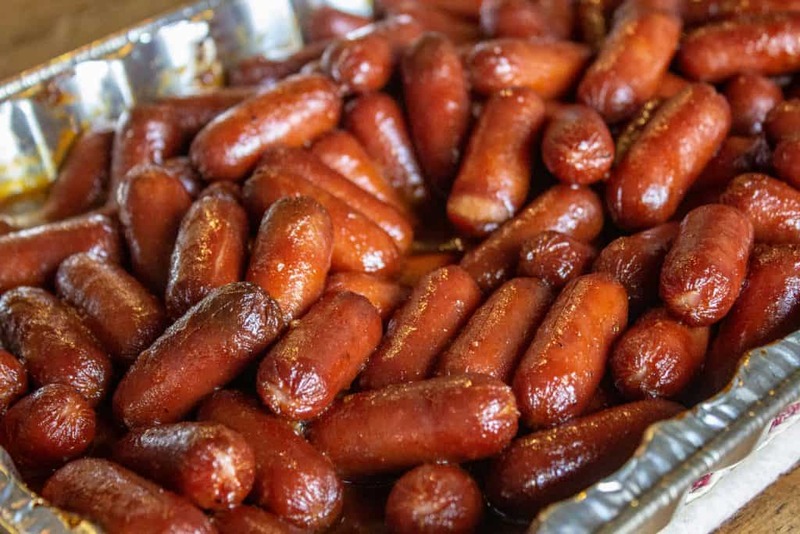 Serve these little smokies with toothpicks, and watch them disappear! How Much Longer Would Frozen Little Weenies Take? You might be wondering how much longer this recipe would take if you used frozen little weenies. 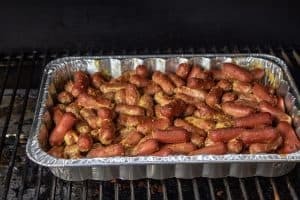 Ideally, you want the little smokies to be defrosted prior to cooking so you can get them coated with the mustard and rub. It shouldn’t take long to defrost the packages. My favorite way to defrost frozen meat is to leave it in the package, and run it under room temperature water. 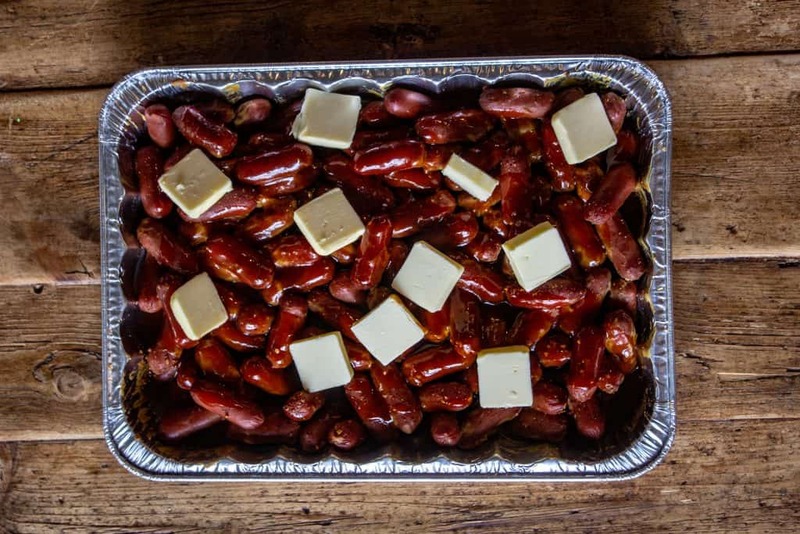 Can You Use This Recipe With Cheddar Lil Smokies? 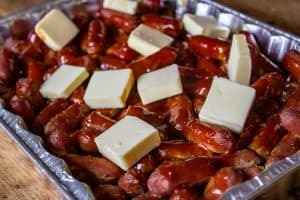 I’ve had a few people ask if you can use cheddar lil smokies instead of the regular style. My answer is ABSOLUTELY! Cheddar lil smokies work great in this recipe! How Do You Make Crockpot Little Smokies? Honestly, why are you here? Ok I might be kidding… If you want you could make this same recipe in a crockpot. Just follow the same steps… toss the meat in your favorite rub, then put in the crockpot with the whiskey barbecue sauce and let them cook for a few hours. Love This Recipe? 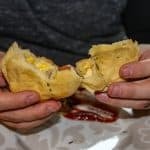 You Might Also Like My Smoked Grilled Cheese Bombs recipe. If you have a tailgate party, a block party, or just a family get together coming up, you're going to want to save this recipe. 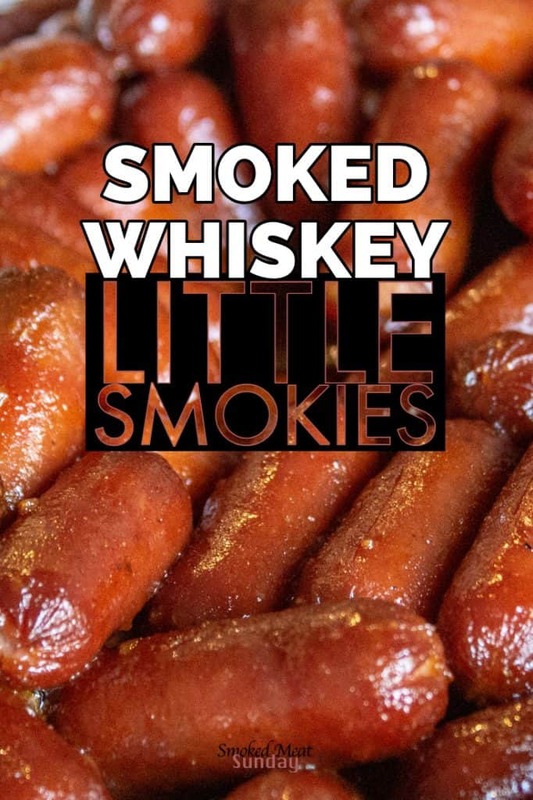 Smoked Whiskey Little Smokies are easy and fun to make, and your friends will love them! Throw the little smokies back in the smoker. Toss them every two minutes. After an hour on high, they will be down, and most of the little smokies will start to get some caramelized sugar on them. This is what we want!